State and local government spending on health insurance grew by twice the national rate for 2012 (link): One of the more alarming data points I have come across while compiling the necessary records for the Transparent California website (link) has been the large sums of money spent on health insurance for public employees. As our site groups together the cost of pension payouts and health insurance in order to present the information in a uniform and understandable manner, the cost of individual health plans was not something we were particularly focusing on. However, in the course of formatting and uploading the necessary records to TransparentCalifornia.com, several agencies jumped out at me due to their alarmingly expensive health insurance plans. First, it was the $20k+ plans in Corte Madera, Calif. (link) and the Contra Costa Community College District. Then I saw the $30k+ plans in Beverly Hills (link). Finally, I came across what remains the most expensive plan I have seen to date — a $37,815 health insurance plan for the Water Superintendent (link) of Sierra Madre, California. I suspected this was not a problem isolated to the handful of agencies whose numbers happened to catch my attention but, rather, indicative of a systemic problem likely to be found in many other public agencies. This sets up a situation where taxpayers are effectively taxed twice for these plans — initially, to fund the public employee’s compensation itself and, again, when they find themselves paying an artificially inflated premium for their own health insurance. Pew Research (link) confirms these suspicions. In 2012, state and local government spending on health care increased by 8 percent; double the amount total U.S. healthcare spending grew during that same time period. The larger trend is terrifying — state and local government spending on health insurance premiums has increased an inflation-adjusted 444% from 1987 to 2012. The agencies above are merely symptoms of a much larger problem. The farther the distance between consumer and provider, the less reason either has to economize, which is a factor in the out-of-control prices we see nationwide in the health-care sector. When a government is willing to spend $37,815 of your money on one health plan, what financial incentive does an insurance company or anyone in the medical system have to work on lowering prices? While there are a plethora of factors responsible for the current health-care crisis in this country, the third-party-payer system, especially when that third party is using other people’s money, like a government agency does, is one of the core issues that demands immediate attention. Why are we not surprised. It just goes along with everything this city or city manager does. What year did these pensions come on board anyway? City employees are the new royalty in town. Goss and Noah will give them the respect and benefits they deserve. Rachelle and Gene are backed by the teachers union. They are pro union all the way. There is no way they will vote NO on any benefit package. Gene negotiated the largest pay raise for teachers at Cal State Long Beach. Denise negotiates on behalf on her employer to keep union benefit packages LOW. Who do you want on the council? Noah Green is in the unions' pockets. Of course, they could be in his pocket if he was wearing pants. What makes you say he is in the pocket of the unions when he is trying to legally protect employers by telling them the proper way to document dismissing an low performing employee? He wouldn't have the support of Harabedian if he wasnt. Yes. Noah also supports Measure UUT, which is a union supported soak the taxpayer initiative. amazing, Noah lives here less than 2 years and decides that we all need to be taxed higher and higher? Who negotiated the city's health plans? Santa Claus? Elisa Weaver Cox and Elaine Aguliar. Both are totally unqualified for this task. They get to reward the people in their departments with large amounts of taxpayer cash. Where the hell is our lazy city council? It's the city of Bell, but worse. When will the hammer fall on this little fiefdom? never attribute to maliciousness that which can be explained by incompetence. Having city staff negotiate employee benefits is like Bob Matheson opening a day care center. I agree. Third party payer is a bad idea because no one has a true vested interest in watching costs. Personally, I think something along the lines of an HSA, health savings account, is a great way to go. Starting in 2018, a tax in Obamacare known as the "Cadillac Tax" will impose a 40% excise tax on plans above $10,200 for individual plans and $27,500 family plans. This will result in plans like these costing the local municipalities even more as they will have to pay an additional $5-$20k of these excise taxes, which, of course, will also be borne by the taxpayer. This is not good for anyone. Even the government will suffer if it does not relent from destroying the working class that sustains it. This is another case of a legislative issue which has a kernel of truth to it, but which has been misinterpreted, affects only a small percentage of the population, and has misleadingly been blown out of proportion through someone's mistaken assumption that it applies to everyone. The portion (Title IX, Sec. 9001) of the PPACA referenced above is entitled "Excise Tax on High Cost Employer-Sponsored Coverage." This is the section of the recently passed health care reform legislation that addresses taxing so-called high-level "Cadillac" health care plans that some employees receive through their employers. Many employers pay most of the premium for health coverage. 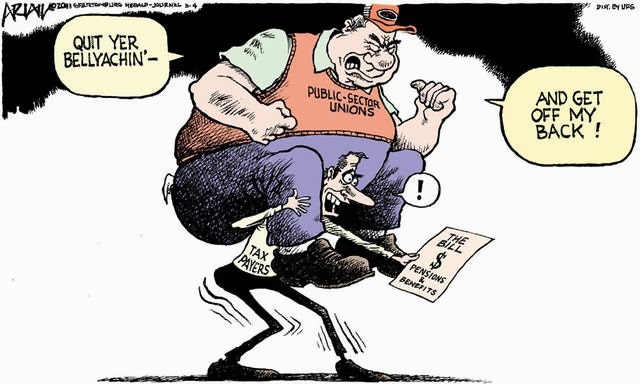 Workers pick up the rest but pay no taxes on the employer's often-substantial contribution. That's why many unions have bargained hard for generous health coverage over the years, even if that meant forgoing a bigger pay raise. The new agreement would take away the tax advantage for a small portion of the health benefit by imposing a 40 percent tax on the amount by which the premiums for employer-sponsored health coverage exceed specified thresholds. That would be $27,500 a year for a family, starting in 2018. The tax on a $29,500 plan would be $800, or 40 percent of $2,000. The insurance company would pay the tax but would almost certainly pass it along to the employer and its employees. That $27,500 threshold is well above the current average of $13,400 for a family plan. By 2016, more than 80 percent of all family plans are projected to still fall below the threshold. In the following years, the tax threshold would rise more slowly than the likely rate of inflation in medical costs, which could mean the plans of millions of workers — a small minority of the work force — would be subject to the tax in theory. Most likely, insurers will drop their premiums just below the threshold. They could do that by setting higher deductibles and co-payments, managing access to care more tightly, or reducing benefits. Although it seems like this is worse than the scenario I was concerned with. While an additional tax on government would have been a problem, it seems the consequence the snopes article foresees harms the people even worse and certainly more directly. All of the hypothesized possibilities - setting higher deductibles and co-payments, managing access to care more tightly, or reducing benefits - result in more expensive and/or worse health care for the consumer. This is out and out corruption. The person who negotiated those benefits should be fired. Does the City Council get into the level of detail to know this is going on? If so, whoever voted for it should be recalled. Based on these figures, do the two city council candidates who are in favor of a UUT tax wish to reconsider their position? I mean its one thing if our tax money is used wisely. Its another thing when its being used to line the pockets of city employees so that they can retire at 50 with a big fat pension and extravagant health insurance. It all starts with Elaine Aguilar and she should be fired immediately for malfeasance and corruption. Has Arizimendi actually said NO on the UUT? I have read her "choke a horse size" mailers. None of them say she is against it. Yes. She stopped by our home and we talked about Measure UUT. She finds it to be outrageous. 9:36, you would prefer Green and Goss? Get a grip! The Mumbling Mortician and Noah Pants are inspirational leaders for many. It's a classic divide and conquer strategy - get the 2 fiscally responsible and slow growth candidates to mistrust each other, and hey presto, the tax higher and build bigger guys win the majority. If that is actually happening, I cannot believe the Rachelle and Denise campaigns were dumb enough to fall for it. The landing page of Arizmendi's website has said she is against the UUT since it went up December. 11:14, don't confuse people with the facts. How did this happen, and why weren't we told? Off topic, but has anyone tried to get on Coburn's site lately? It has been done for at least a day. Just tried and all I get is a blank page. Not really all that different than when the site is up. Think of all the homeless press releases. I can't get on Coburn's site either. The community must be in a state of panic. I hope this won't hold up Bill's endorsement of Gene Goss! A surveyor is on west bonita this morning, surveying what? Relatives of Bruce? What kind of plan is that? Anyone know just what $37,815 buys in health care? A new body to store your soul. Is there a clerical error, and the comma is in the wrong place? $3,781.50 maybe. amazing - can retire at 50 and get a cushy pension for what? reeks of taxpayer fraud with intent. Done with the full complicity and knowledge of our Mayor, Mayor Pro Tem and two Councilmembers. Time to bring in the DA. The people get who they vote for. I hate to say this, but Capoccia is as much of a weasel as thise other three. I cannot believe I voted for him. JC motto is "can't everybody get along"? or "are you willing to risk a lawsuit if they can't build what they want"? ITS LOOKS LIKE SOME RESIDENTS IN TOWN HAVE FINALLY WAKEN UP! They're gojng to close the Library! No, really! It is a largely unused building that our money mad City government uses to guilt trip money out of the taxpayers. Looky here whipper snappers. Only real books with real paper count. Not those electronic books on the internet machine. Project Gutenberg can hook you up with 100,000 books. Online. Free. No Looney Views News downtown yet. Of course, it is Rachelle's week, and you know how Fibber Henderson feels about her. Next week is Noah, and I am sure it will be on the streets bright and early Saturday morning. and next week I'll be out picking up extra copies of the Looney View News and tossing them in the recycle. Nobody really reads that, yeah? When you do that, Henderson can report more circulation. I'd rather let them gather dust in the racks. I don't think Hemderson reports any numbers - either printing or circulation. Like everything Henderson does, there is a large degree of fibbing involved. Last week when Denise was featured the papers were not put in City Hall. I have an enthusiastic analytical eye intended for detail and can foresee problems before they will take place. Let the good time roll, or in this case "keep Rolling" got to keep the employees health pyramid scheme alive, you know someone is getting a pretty big payback or is that called a kickback? Is this a health plan the goes life long and covers every eventuality for the person and his family? How the hell could it be so much? It's a good question and I am also curious as to what it provides. The answer to why it costs so much has very little with what it covers and much more to do with the lack of concern for how much it costs by the purchaser - the government. If you keep buying my product, regardless of how much I charge for it, I'm going to keep raising the price! Anyone open up your water bill. The city is flat out lying about the UUT. Not only will we loose the police and library, but there will be no money for anything. The city has opened itself to a ton of lawsuits. Harabedian and Capoccia are idiots. what's wrong with losing the police department? sort of a pattern with this city isn't it?